Looking back on our year of travel, a few days specifically stand out as some of the most spectacular days of my life. Some of our experiences from our RTW 2012 will probably go down as the best memories EVER (cue dramatic music). 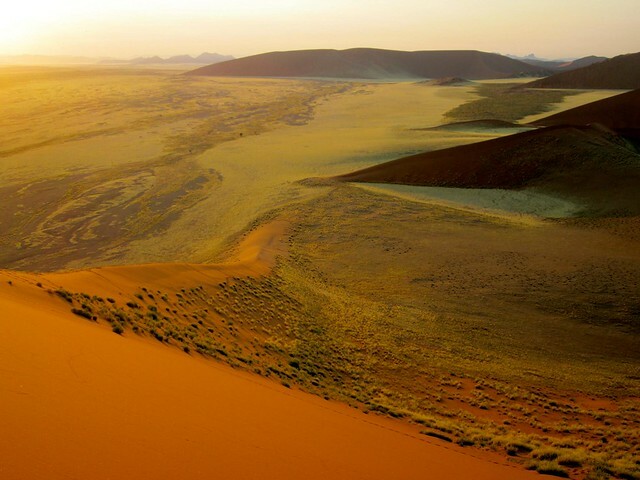 Everywhere you look in the The Namib Desert you see sand dunes rising 100 – 450 meters above the ground. 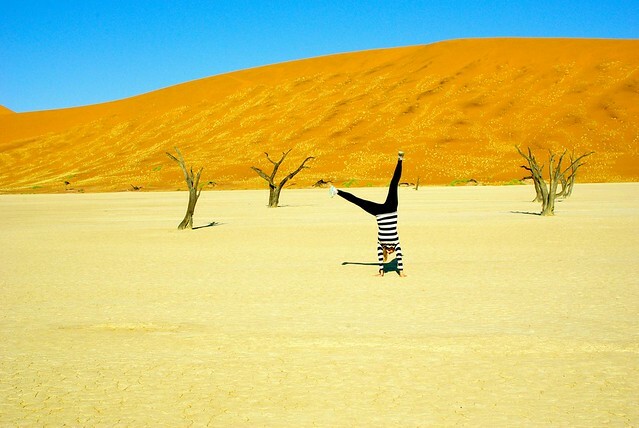 Visiting Sossusvlei and climbing around the massive sand dunes was incredible, and I can’t believe that I have yet to share some of our photos and stories with you! 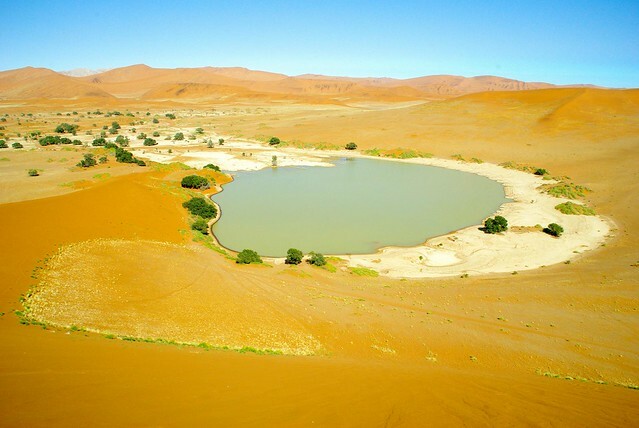 To get the most out of Sossusvlei, plan to spend at least one day climbing around the national park, there is so much here to explore. 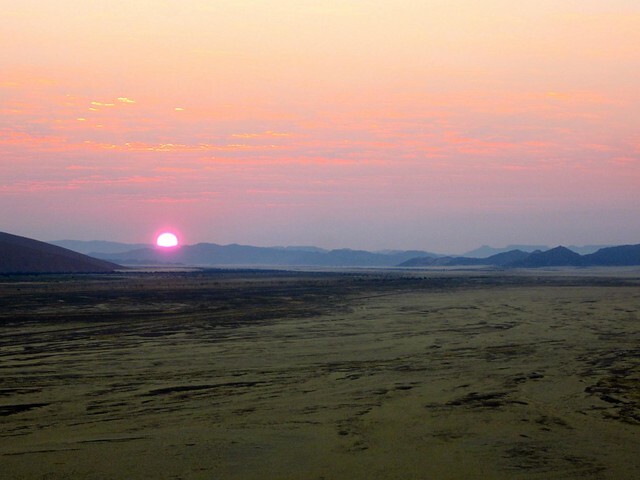 In order to be the first in the park and watch the sunrise from Dune 45 plan ahead and camp at Sesriem Restcamp, run by Namibian Wildlife Resorts. 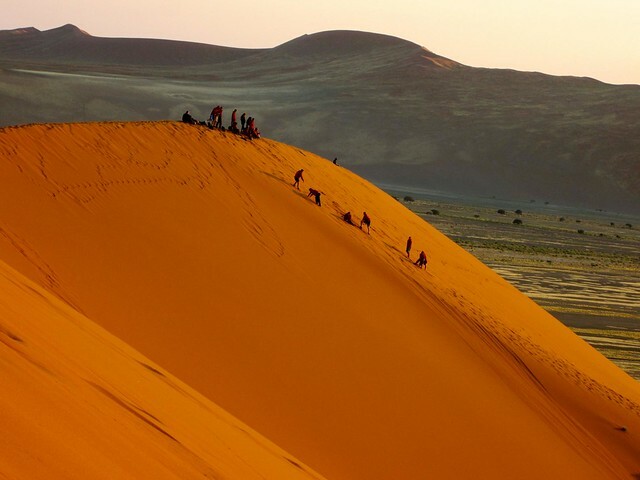 Only guests who sleep at the rest camp or the Sossus Dune Lodge, a much more upscale option, will be allowed in early to climb the dunes prior to sunrise. Sesriem is one of the busiest campsites in the country and can be very difficult to get reservations at. We lucked out and there was an empty campsite the day we arrived (no reservations) and were able to get in. They were booked the next night, so we went a few km down the road to Betesda campsite. Wake up early and get in line with the other cars as you all race to Dune 45 and start the early morning climb in the dark. Drive with a purpose to the dune, you don’t have a lot of leisure time before the sun starts to rise, we had to skirt around a few cars that were going too slow. 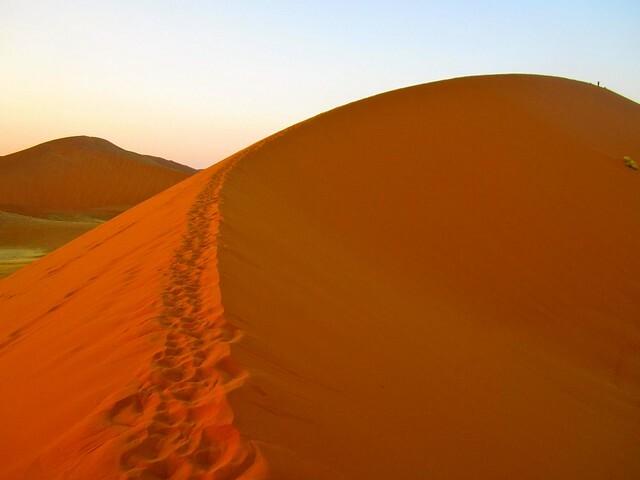 Climbing sand dunes is not a walk in the park, so pace yourself, it’s a long way up! We watched as the high school group next to us wrestled their way down the sandy mountain. Although it was fun to watch them get thrown down a big pile of sand, we walked to the next dune over to find a spot for just us. 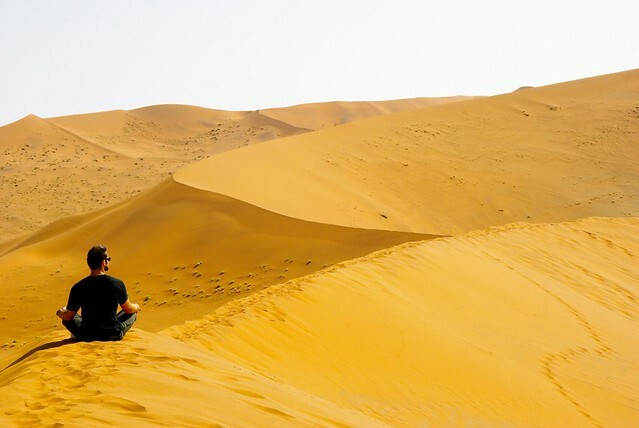 Far enough away so we couldn’t hear them yelling, all we could see was endless rolling sand and we quickly were enveloped in the peaceful moment. My socks and shoes were perpetually filled with sand when we were climbing. I wear the lightweight brooks barefoot running shoes, which apparently are not made to keep sand from pouring in! 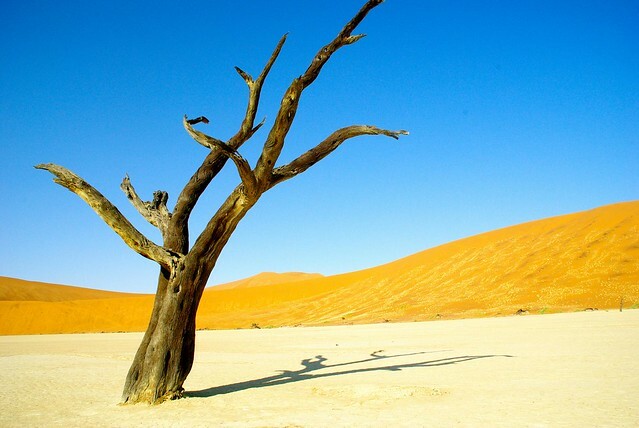 2 km from Sossusvlei you can explore deadvlei, an old oasis, but the river has changed direction and left behind scenic dead acacia trees. 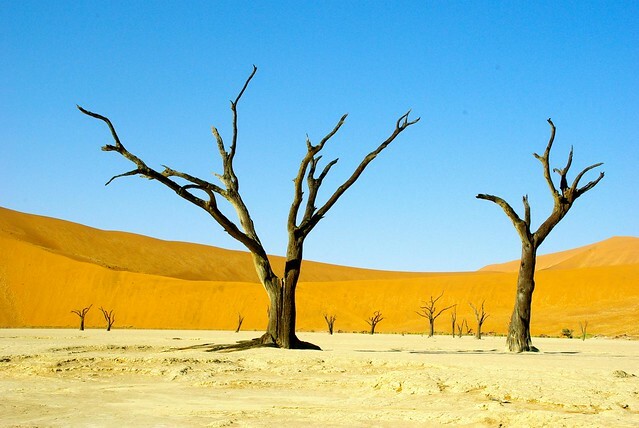 This was one of my personal favorite spots to walk around with the drastic contrast between the dead trees, white clay pan, red dirt and bright blue sky. Of course I couldn’t resist my signature cartwheel. 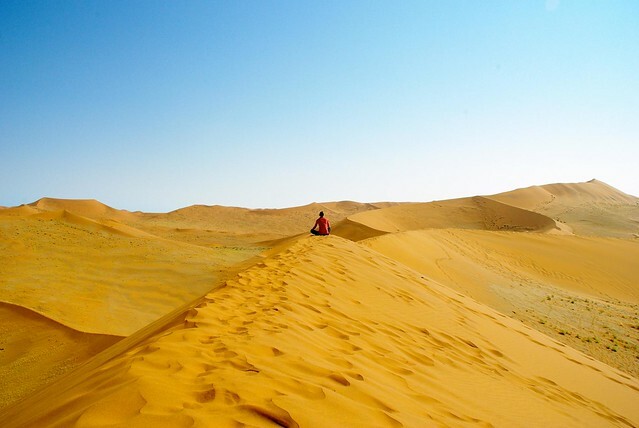 When you climb the sand dunes here you feel as if there is no end. You can climb forever and there is always more to explore. 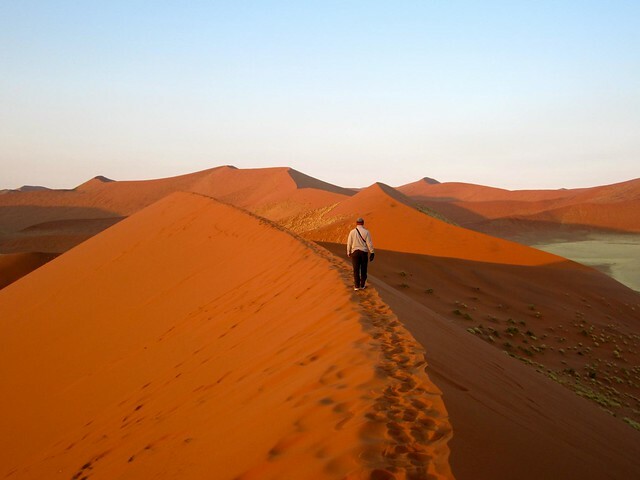 There is always another higher sand dune that leaves you wondering what is the view is like from there. O yeah…did we mention that we had somehow picked up a huge 3 1/2 inch bold straight through our tire? AND one of the shocks on the car had been completely knocked off? 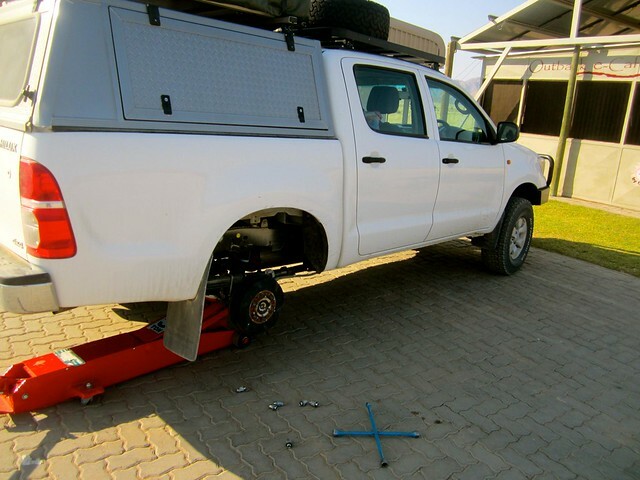 Before we hit the road we were able to get the campsite mechanic to weld together some parts for the shock and visited the one gas station across from the campsite to get the tire repaired and checked for the final week of camping through Namibia. Bring layers – The mornings in the desert are chilly, colder than you think. We had on fleeces, hats and gloves and we could have worn an extra layer and been a bit warmer. 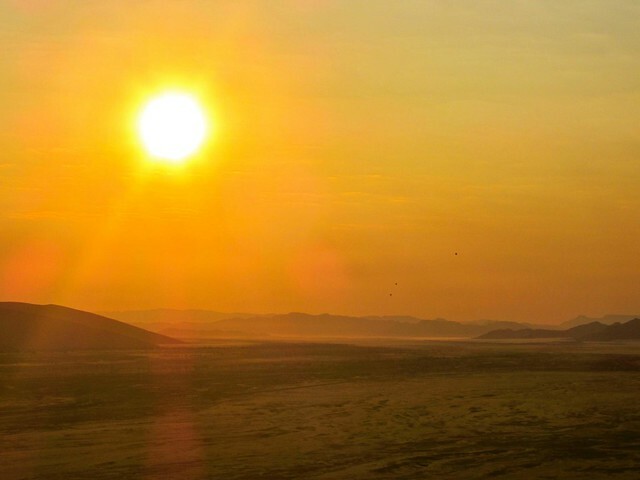 The sun quickly heats the area and the afternoons are hot. I suggest wearing multiple layers you can take off as the day goes on. Bring water and snacks – Once you are in the park there is no concession stand for you to pick up a bottle of water or quick snack – plan ahead! We brought classic PB&J sandwiches prepared the night before. Book your campsite early – Since everyone wants to be the first group in the park this is a popular campsite. Plan ahead and secure these nights early. We showed up the day of and got an alternate half campsite in the front, we got lucky – I wouldn’t risk it if I did it again! Terrific photos! Wonderful colors and perspectives. Looove those photos! 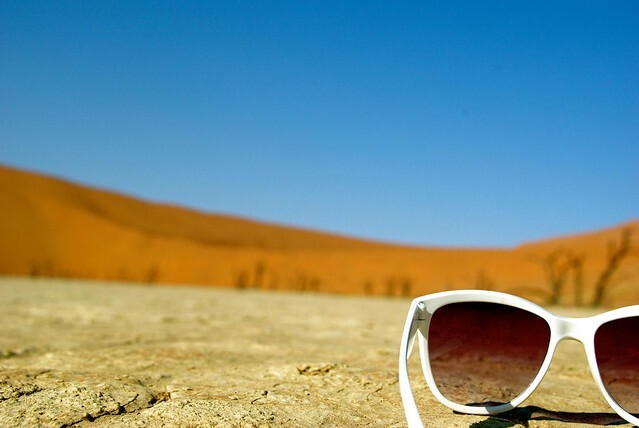 Have only been in the Moroccan Sahara so far, but the Namibian one looks much more impressive I have to say! WOW! What a dramatic landscape! 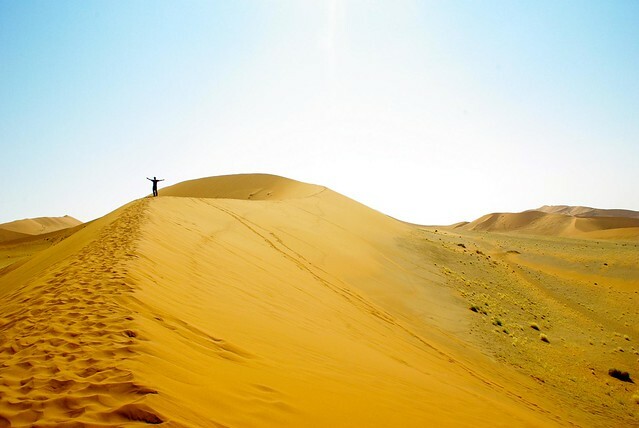 I’ve been to the Negev desert before, but it looks very different! 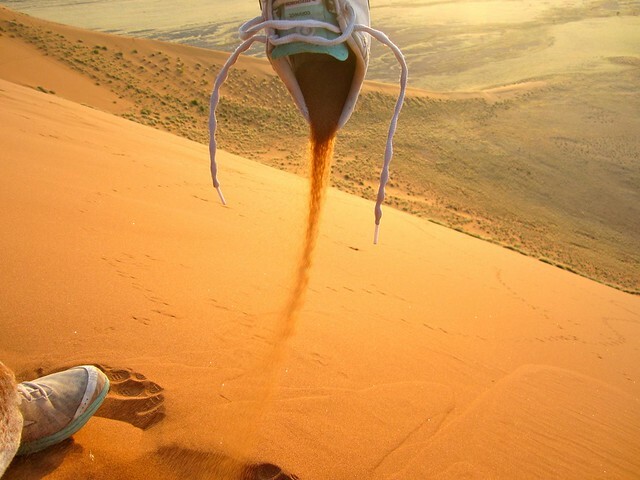 And crazy about all that sand in your shoes- kind of expected I guess! You will love it, and I think 3 days is a good amount of time to explore the area! Are you traveling around to other parks also?